Dinosaurs from the Centrum collection photographed in-situ, 2015, photo courtesy Centrum. Behind the generic name Centrum lies a center for relaxation, gardening, and self-instructional activities, located on the site of an allotment garden in Szczecin and founded by anonymous visual artists. The creators strive to maintain the dual and non-obvious status of the place, which on a day-to-day basis does not differ from the other surrounding garden plots (see: 1:1 scale). They define the profile of Centrum as a unit involved in “research in the field of art, as well as the cultivation of fruits, vegetables, and plants. The interests of Centrum also include geology and criminology.” The “capital” of Centrum is built on exchange: cardboard “gold bars,” are awarded to artists and theoreticians for their contribution to the development of the center. The activity of Centrum is an example of “patainstitionalism,” based on exploitation of the organizational potential of the imagination and attempts to implement new, grass-roots institutional models seeking to deconstruct traditional conceptual edifices. 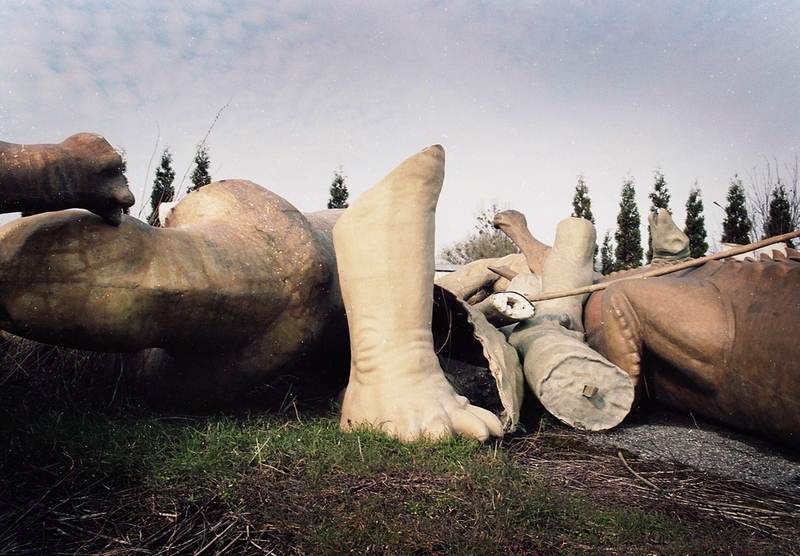 Centrum, much like public art institutions, has its own collection, made up of objects of unknown provenance and purpose, stones that are part of land art works from the 1960s, and an annexed “found exhibition”: a cemetery of plastic dinosaurs stored on former factory grounds near the town of Police, in northwestern Poland. The report presented in exhibition consists of a plastic dinosaur leg from Centrum’s collection, loaned to the Museum of Modern Art in Warsaw for the duration of the exhibition. Courtesy Centrum.